Vietnamese people go to the flower markets to not only choose and buy beautiful branches of peach or apricot flowers, but also find relaxed moments and hope for a warm spring and a prosperous new year. The spring flower festivals usually take place from the 23rd day of the last lunar month to the 5th day of the first lunar month in parks, flower gardens in towns, cities or communal houses in rural areas. Each locality also organizes the own spring flower festivals to welcome New Year, of which the spring flower festivals in Ha Noi and Ho Chi Minh City are typical. Ho Chi Minh City Spring Flower Festival held annually in Tao Dan Park (District 1) is the biggest flower festival in the city. In Tet days, the festival is the converging place of famous Southern bonsai artisans from Long An, My Tho (Tien Giang), Can Tho, Sa Dec (Dong Thap), Da Lat (Lam Dong), Bien Hoa (Dong Nai), Ben Tre, Vinh Long... In recent year, the spring flower festival has the attendance of foreign artisans from Thailand, Taiwan with rare orchid species, Japanese artisans with bonsai and flower arrangement art. In the campus of the park, flower works attending the festival are arranged scientifically according to own themes to serve visitors. Of which, pavilions of yellow apricot flowers, the symbol of Southern spring are typical and attract many visitors. The display area of rock-gardens gathers many artisans with a large number of objects divided three categories of big rock-garden, middle rock-garden and small rock-garden. From natural rocks and adhesives, through talent hands, diversified imagination and romantic soul, the artisans created countless masterpieces. 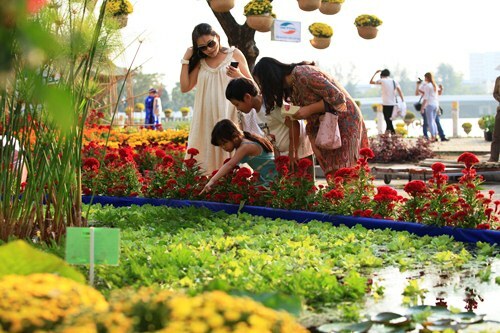 In the fresh flower area, visitors are attracted by diversity and splendid beauty of flowers. The orchid baskets create special attention with rare and beautiful wild orchid species such as tuyet mai, long tu, y thao, gia hanh, hoa hoang,hai yen... Along with orchids, other flower species as roses, tulips, cactus... also attract a lot of visitors. Like Ho Chi Minh City, in Ha Noi, traditional flower markets such as Quang Ba, Hang Luoc... attract most people to visit in Tet holidays. As the biggest flower market in Ha Noi, Quang Ba Flower Market (Tay Ho District) is open every day from early in the morning until midnight and is considered the market where sell most variety of flowers. Flowers in Quang Ba are imported from flower villages in Ha Noi, including Quang Ba, Nghi Tam, Nhat Tan, Dam - Cau Dien and other famous flower areas nationwide. Quang Ba Flower Market becomes more crowded and busier than on Tet holidays. Besides the regular customers including flower shops in Ha Noi, many people, mostly young people, go the flower market to enjoy Tet atmosphere and buy flower species for decorating their house during Tet. Founded in the 1920s, Hang Luoc Flower Market is located on Hang Luoc Street and extends down nearby alleys. This market is only open from 23rdday to the 30th day of the last lunar month. Each year, on the 23rd day of the last lunar month, Hang Luoc Street is turned into a flower market for Tet. Sellers take peach, kumquat and apricot trees, roses, sunflowers, carnations... from flower villages in the city to the market. Visitors can choose their favourite flowers and enjoy the beauty of all kinds of flowers. Visiting the flower market is a unique cultural feature of Ha Noi’s people.